Stephen Bradley was full of praise for teenager James Doona, who scored a dramatic last minute winner for Shamrock Rovers against Cork City last night. James Doona (below) celebrates scoring a last minute winner in Rovers' EA Sports Cup semi-final win. 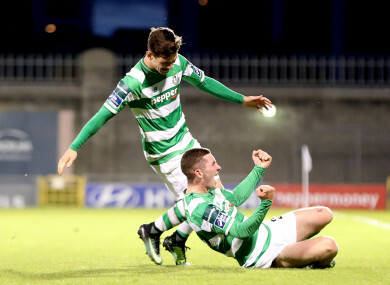 SHAMROCK ROVERS HEAD coach Stephen Bradley admits he was thrilled by the composure and guile shown by 19-year-old midfielder James Doona to score a stunning last minute winner in extra-time of their EA Sports Cup semi-final, but was not too surprised. The teenager has grown into a highly-rated prospect since joining Rovers’ U19 squad in 2015. In less than two years he is making a name for himself in the senior side and is giving his manager selection headaches in a starting eleven already brimming with quality at almost every turn. With last night’s meeting with Cork City destined for penalties, Doona latched onto a cross into the box and, swiveling with a jink and turn at the back post, took the ball onto his weaker left foot before slamming a dramatic 120th minute winner past Mark McNulty, sparking a pitch invasion. “We created chances but it looked like it was going to penalties,” said Bradley afterwards. “It was just one of those nights but then James made some magic out of nothing. “To be fair to him he is a young boy and he has had to be patient. Getting games has been difficult because Trevor (Clarke) and Brandon (Miele) have been really good this season. I just thought tonight the way they were defending he was the one to unlock it for us. “I think we put him on just at the right time. Because he hasn’t played many games I didn’t want to put him on early. We were laughing when he scored because he does it to everyone in training. “He feints and feints and shifts the ball because he can play with both feet. It was a great goal. I don’t think he had it in his head that he was playing in a semi-final against Cork. The Rovers boss said getting to a cup final was a significant milestone for a side in transition and that the result against the league leaders showed a mental resolve to topple big rivals. “It’s massive. That was the talk before the game, that if we want to go forward we can’t keep saying that we’re playing well and creating chances but are losing games. “We know that there are only so many times that you can keep doing that as a group. There comes a point where you have to learn how to win a game and get to a final. “If you do that as a group it helps you come together so much. We did that with Drogheda in the FAI Cup. Rovers had failed to beat Cork in both meetings so far this season, while also being knocked out of the FAI Cup 5-0 at home to John Caulfield’s side last September. Beating the champions-elect for the first time in two years marked a significant progression for his Rovers side, with the manager indifferent about the venue for September’s final against Dundalk. “For me it was a point to prove for our players. I felt that we have done well against Cork this year, we’ve played well and haven’t been too far off when we’ve met head-to-head. I knew John would come full-strength and it was up to us to meet them head-on. “We haven’t beaten Cork this year so it was a massive mental barrier for our players. Now we know we can beat Dundalk, which we have done twice this year. “You want to try and catch these teams in the future and to do that you have to know you can go and beat them. Email “'We were laughing when he scored because he does it to everyone in training'”. Feedback on “'We were laughing when he scored because he does it to everyone in training'”.